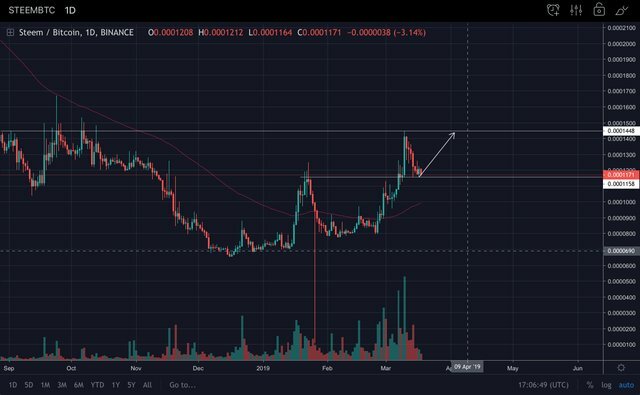 Steem: Potential to buy back for a higher target!steemCreated with Sketch. It has been a while since my last post on Steemit regarding Technical Analysis. Today, I have just checked the Steem/BTC rate on Binance and I have found some nice setup. From this Daily chart, what I can see here is Steem has been holding the support zone very well. 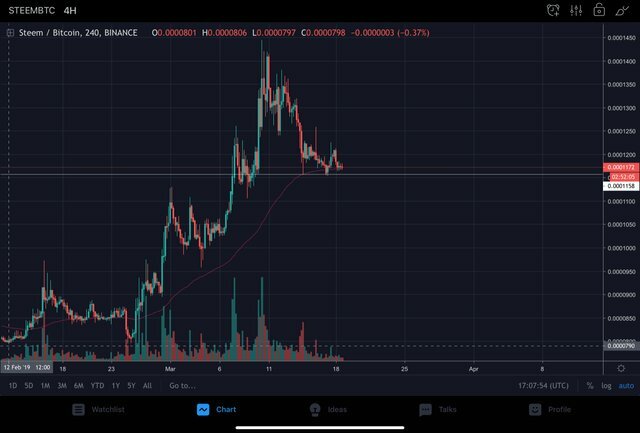 From the chart, we can see that the 11104 area had formed up as a support area for Steem. By seeing this, I have purchased some Steem on the exchanges, and use some for blockchain and some for trading. My estimated target should be around the 14450 level. From here, we will watch closely, if Steem is to have a clean break, we can aim for the higher skies! On the other hands, I believe the hype is real that we are testing TestNet. I do hope that Steem price will move up and more people will invest in Steem. My general outlook in the short term for Steem is Bullish, but for the long term, we need to see if Steem can break the 14450 level or not, since it was a significant zone. Have fun and trade safe! Sorry to ruin your hope but I doubt this day is not gonna happen anymore. I would prefer to sell Steem at $0.55 onwards to $1.55, then re-buy when it goes below $0.30. Just imagine, if Steem is to reach $8, Bitcoin might need to rise to $20.000. Take a look at Bitcoin price now and ask yourself, will you buy Bitcoin at $4000 now, or wait to $20.000 to buy? Instead of waiting for Steem going to $8, sell and buy back multiple times, profit might be the same, and we don't need to wait too long. I very upset, I bought Bitcoin at $6800, but in this time i trade others altcoin not steem. Thank you for your advice and i will try trade steem. What I have learned is, Bitcoin is just a commodity that is used to trade with other coins. I do not treat Bitcoin as money to trade, because, money is a medium of storing value, and Bitcoin cannot hold its value. Kid me not, you might see Bitcoin to reach $2500 within this year.